The sculptor Rachel Whiteread endows space with a tangible physicality of its own. Her established practice is to make objects from the space around or within familiar domestic items: chairs, mattresses, entire rooms, cast directly in plaster, rubber, resin or concrete. They originate in childhood experience of claustrophobia and concealment, but have come to suggest absence and loss, the traces of objects in the spaces they leave behind. In1993 she made a concrete cast of an entire house interior in the East End of London; when the house was demolished as part of an urban clearance programme, the cast within it remained as a kind of memorial to the lost building. Her suite of screenprints documents the continuation of East End housing demolition. 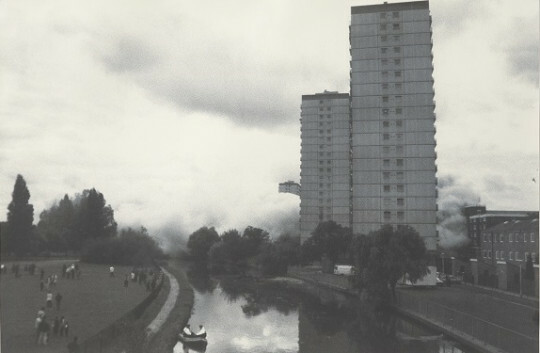 The images show the demolition of three tower blocks of public housing flats in the East End of London and originated from the artist’s own 35 mm colour slides. The slides were stripped of colour to be screenprinted in grainy black and white as if they were reportage works from a war front. Demolishedwas published in 1996 by Charles Booth-Clibborn under his imprint The Paragon Press and printed by Coriander Studio, London in an edition of 35.